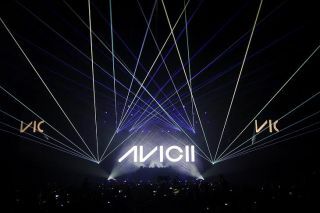 DJ and record producer Avicii’s current tour features video production – LED, projection and control - supplied by XL Video. The show is touring Europe and the UK under the Tour Direction of Curly Jobson, Production Manager is Robin Scott and the visuals have been produced by Harry Bird from This Is Comix who is also the Live Show Director. XL Video’s Project Manager is Paul ‘Macca’ McCauley, and XL’s Crew Chief on the road is Icarus Wilson-Wright. There are two screen areas onstage. The upstage one is made up from XL’s Pixled F-12 LED product, approximately 60ft wide and 18ft tall, hung in steps on the sides to replicate the diagonal wall of the design. The front of the DJ booth is clad with Barco OLite 510. The O-lite is used in ‘creative’ mode which enables versatile shapes to be constructed and then accurately mapped. In this case, it is built into bespoke frames from XL following the diagonal lines of the set. Both types of screen are robust and suitable for touring, and the F-12 is built into XL’s lightweight touring frames which make it quick and easy to rig. The show’s playback video content is run completely live – there’s not a sniff of timecode on this show - by Harry Bird using a Resolume Arena system, with another Resolume set up used for footage, images and graphics for the support DJs. Two 20 x 11 ft portrait side projection screens are fed by rear-projecting Barco 26K FLM machines. Most of the time these screens mimic the playback content showing on the main screens with some occasional snapshots of IMAG … for which XL is supplying a 3-camera package. This comprises a Sony HXC-100 operated camera at FOH with a long lens and a Bradley Ball Cam 2 located behind Avicii taking care of the reverse crowd shots on the riser, and the camera mix - by XL’s Ray Gwilliams using a Panasonic MX100 switcher. The visuals also embrace lighting, lasers and special effects - all elements are called live as-it-happens as there’s no set list and Avicii plays a fully unique set each night, although certain anthemic tracks are usually included in the performance.It’s a way that suits Bird’s style of show direction and VJ’ing. He also used to DJ himself which brings an additional level of understanding, rhythm and dance musicality to the technical production mix. When it came to creating the video he worked closely with Tim Bergling (Avicii) and produced footage to match the different sounds. Translated roughly, his newer work features more organic ‘live’ sounds and is accompanied with a fuller and more filmic look to the video material; while for the more traditional dance tracks, the video is more super-tron orientated with trippy neony colours and shapes.